Give this inflatable your best shot and challenge your guest to a free throw game. A favorite game among the carnival scene, basketball shooting games are fun and a great fundraiser as you challenge people to make points and win prizes. Prizes are not included! 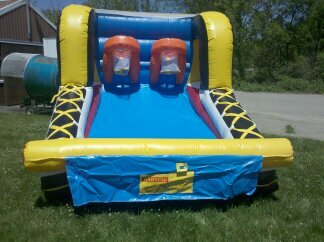 Cost of Inflatable Game Rental includes delivery and set up to Milford, South Lyon, New Hudson, Novi, Northville, Highland, Wixom, Walled Lake and Salem.